Risks relating to contamination The system is very sensitive to contamination. The risks caused by the introduction of contamination are: • Damage or destruction of the high pressure injection system and the engine, • Seizing or leaking of a component. All After-Sales operations must be performed under very clean conditions. This means that no impurities (particles a few microns in size) get into the system during dismantling or into the circuits via the fuel unions. The cleanliness principle must be applied from the filter to the injectors. WHAT ARE THE SOURCES OF CONTAMINATION? : It is not possible to clean the engine using a high pressure washer because of the risk of damaging connections. In addition, moisture may collect in the connectors and create electrical connection malfunctions. • Ensure that you have the plugs for the unions to be opened (bag of plugs sold at the Parts Stores - Nissan part No. : 16830 BN700, Renault part No. : 77 01 206 804). Plugs are to be used once only. After use, they must be thrown away (once used they are soiled and cleaning is not sufficient to make them reusable). Unused plugs must be thrown away. • Ensure that you have hermetically resealable plastic bags for storing removed parts. Stored parts will therefore be less subject to the risk of impurities. The bags must be used only once, and after use they must be thrown away. • Lint-free towelettes to be used for injection pump related service purpose. The use of a normal cloth or paper for cleaning purposes is forbidden. These are not lint-free and may contaminate the fuel circuit of the system. Each lint-free cloth should only be used once. • For each operation, use new thinner (used thinner contains impurities). Pour it into a clean receptacle. • For each operation, use a clean brush which is in good condition (the brush must not shed its bristles). • Use a brush and thinners to clean the connections to be opened. • Blow compressed air over the cleaned parts (tools, cleaned the same way as the parts, connections and injection system zone). Check that no bristles remain adhered. • Wash your hands before and during the operation if necessary. • When wearing leather protective gloves, cover these with latex gloves. • As soon as the circuit is open, all openings must be plugged to prevent impurities from entering the system. The plugs to be used are available from the Parts Stores - Nissan part No. : 16830 BN700, Renault part No. : 77 01 206 804. They must not, under any circumstances, be reused. • Close the hermetically sealed bag, even if it has to be reopened shortly afterwards. Ambient air carries contamination. • All components of the injection system that are removed must be stored in a hermetically sealed plastic bag once the plugs have been inserted. • The use of a brush, thinner, bellows, sponge or normal cloth is strictly forbidden once the circuit has been opened. These items are likely to allow impurities to enter the system. • A new component replacing an old one must not be removed from its packaging until it is to be fitted to the vehicle. • The engine must not run with: - Diesel containing more than 10% diester - Petrol, even in very small amounts. • The system can inject the diesel into the engine at a pressure of up to 140,000 kPa (1,400 bar, 1,428 kg/cm2, 20,300 psi). Before carrying out any work, check that the injector rail is no longer pressurized and that the fuel temperature is not too high. • You must respect the cleaning and safety advice specified in this document for any work on the high pressure injection system. • The engine must not operate with: - Diesel engine fuel containing more than 10% diester, - Petrol, even in tiny quantities. • The system can inject the diesel into the engine at a pressure up to 1400 bars. Before carrying out any work, check that the injector rail is not under pressure and that the fuel temperature is not too high. • Removal of the interior of the pump and injectors is prohibited. Only the flow actuator, the fuel temperature sensor and the venturi can be replaced. • For safety reasons, it is strictly forbidden to slacken a high pressure pipe union when the engine is running. • It is not possible to remove the pressure sensor from the fuel rail because this may cause circuit contamination malfunctions. If the pressure sensor fails, the pressure sensor, the rail and the five high pressure pipes must be replaced. 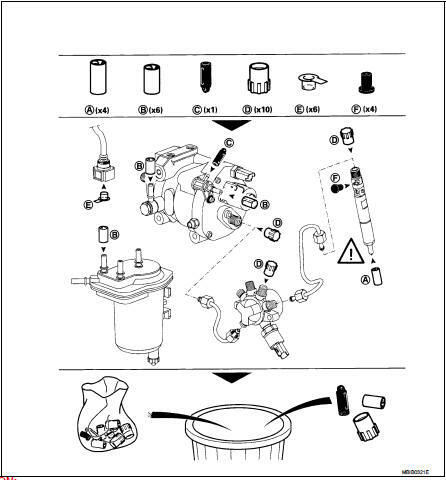 • It is strictly forbidden to remove any injection pump pulley marked number 070 575. If the pump is being replaced, the pulley must be replaced. • It is forbidden to repair the wiring connecting the knock sensor (accelerometer) and the CKP sensor (engine speed sensor). If the wiring should fail, it has to be replaced with new wiring. • Applying 12 volts directly to any component in the system is prohibited. • Ultrasonic carbon removal and cleaning are prohibited. • Never start the engine without the battery being connected correctly. • It is essential to replace all the disconnected air inlet plastic pipes. There is a 16 digit code on the injectors called individual injector correction. This code is specific to each injector, and takes into account differences in manufacture and specifies the flow injected by each of them. When an injector is replaced, it is necessary to program the code of the new injector into the ECM. Refer to EC-919, "Diagnosis Procedure". All the high pressure pipe removed must be systematically replaced along with the clips. fit the pump/rail pipe before the rail/injector pipes. • Insert the high pressure pipe olive into the taper of the high pressure rail inlet. • Tighten the high pressure pipe nuts on the rail side then on the pump side. • Tighten the nuts of the high pressure pipes on the injector side first and then on the fuel rail side. Before fitting a new high pressure pipe, move back the nuts on the pipe then lightly lubricate the nut threads with the oil from the sachet provided in the parts kit. After any operation, check that there are no diesel leaks. • Reprime the circuit using the priming pump. • Start the engine and allow to warm up at idle speed, visually inspecting for any fuel leaks. • Apply tracing fluid around the high pressure connections of the pipe that has been replaced. • Once the engine coolant temperature is above 50°C and provided there are no malfunctions present, carry out a road test, taking the engine speed up to 4000 rpm at least once to check that there are no leaks. • Perform a visual inspection after the road test to make sure that there are no high pressure leaks. • Clean off the tracing fluid. Individual injector correction is a factory calibration carried out on each injector to adjust the flow of each one precisely, taking into account differences in manufacture. The correction values are written on a label affixed to each injector then entered in the ECM which can then control each injector by taking account of their differences in manufacture. The system can be programmed “WORK SUPPORT” mode with CONSULT-III. The correction values (16 digit code) must be replaced after replacing an injector. Refer to EC-919, "Diagnosis Procedure". • Entering each injector's individual correction value, when replacing the ECM. Refer to EC-879, "Description".